Therefore, the derivative of a B-spline curve is another B-spline curve of degree p - 1 on the original knot vector with a new set of n control points Q0, Q1, ..., Qn-1. In the following left is a B-spline curve of degree 5. 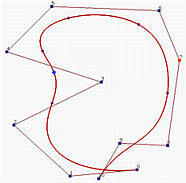 Its derivative curve, which is a B-spline curve of degree p-1 defined by the new n control points, is shown in the middle. As in the Bézier curve case, this is the hodograph of the original curve. Below right shows the same hodograph with control polyline removed. Since the first derivative of a B-spline curve is another B-spline curve, recursively applying this technique one can compute higher derivatives without any difficulty.